Tír na nÓg Forest School offers an immersive educational experience that encourages hands-on learning. It’s an experience that involves being in nature over an extended period of time: children come to know and appreciate a woodland as it changes with the seasons. As children watch the cycles of life unfold over time, their relationship with the forest strengthens. This regular contact with nature gives children a lasting sense of belonging within the natural world, one that they can carry with them through the rest of their lives. We at Tír na nÓg Forest School believe that direct exposure to nature is imperative to young children’s development, as well as to their physical and mental health. We believe that everyone has something to learn, as well as something to teach. Each day in our school, our children will have the opportunity to connect, engage, and learn as individuals and within a community. We also recognize that not all children learn in the same way or at the same pace; at Forest School our children are given the time and space to work in smaller groups based on their development, level of understanding, and interests. In keeping with Forest School's ethos, children also have ample opportunity to explore concepts creatively and independently. Based on a growing body of research into the benefits of Forest Schools and nature play, coupled with our years of personal experience in the field, we believe that Tír na nÓg Forest School can provide children in Elementary School with an exceptional learning environment that will stimulate their creativity and allow children to develop a life-long love of learning. We welcome your family to join us for this educational adventure! 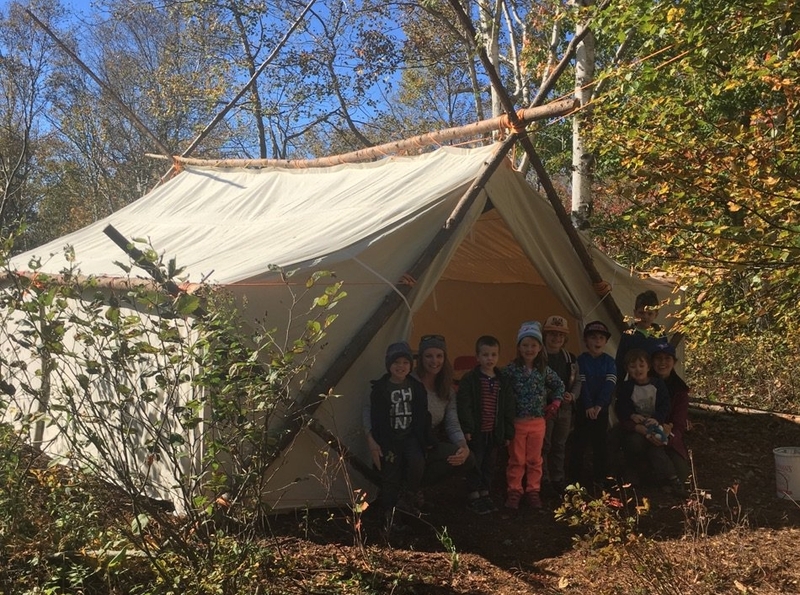 Tír na nÓg Forest School’s Elementary Program is located within one of Canada's largest urban parks - Rockwood Park- in the heart of Saint John, NB. As a Stonehammer Geopark site, the children attending this school will have access to unique rock formations, dozens of hiking trails, hills, fields and beautiful freshwater lakes and streams. Registration & Supply Fee: $250 due at the time of registration, non-refundable. Lump-sum payment discount: If a family chooses to pay as a lump-sum at the beginning of the year, they will receive a discount of 2.5% on tuition. Daily school hours are Monday to Friday from 8:00am to 5:00pm. Each day our students engage in planned Literacy, Mathematics, Art, Social Sciences and Science lessons as a whole group or in smaller groups, organized by developmental stage. The activities will be based on the children' interests, play-based pedagogy and real-world opportunities offered by the season and current events. Learning outcomes will be documented by the educators' observations and students written, oral or demonstrative evidence of their learning. We expect to be outside every day, but will have an outdoor tent classroom complete with tables and chairs, as well as a spacious indoor classroom that the students will use for focus work where an indoor space may be necessary and that may be used during extreme weather conditions. Children are expected to be dressed appropriately for the weather, so they should comfortable spending their school day outdoors. Spare clothing bins will be kept at school in case of accidents or wet toes from playing! Educators do a site risk assessment of the outdoor classroom and basecamp area at the beginning of every day to ensure that conditions are safe for children to explore freely. They continue to watch for hazards throughout the day - one of which can be changing weather conditions. We always bring the children inside is during hazardous weather such as high winds and thunder or lightning storms. Celebrating the delivery of our brand-new tiny schoolhouse on wheels! Our lead educators are highly qualified and licensed as New Brunswick teachers and Forest School educators. Using a holistic approach to education that is guided by Forest and Nature School pedagogy, children will develop valuable life-skills and a life-long thirst for knowledge through project and inquiry-based learning experiences. Through hands-on experiences, children will naturally meet and exceed the outcomes of the Government of New Brunswick's Department of Education and Early Childhood Development's Curriculum. Subject outcomes are assessed using various methods: our educators will observe and record evidence that a child has demonstrated or communicated acceptable knowledge of curriculum outcomes during explorations and play. Students will also produce their own evidence of learning through records and reflections through written, oral, or demonstrative methods that are consistent with their developmental stage. through the practical exploration of the natural world. Progress reports will include descriptions of your child’s development in every area of the curriculum and will be based on extensive anecdotal records that the educator will maintain throughout the school year. We have designated times for parents and teachers to meet and discuss each child’s individual areas of strength as well as opportunities for improvement. We highly encourage parent communication and are open to conversations about your child’s progress at all times. Following the steps to make lemonade! Be sure to follow our adventures on our Facebook page!